The interactions between geoenvironmental and anthropic processes are increasing due to the ever-growing population and its related side effects (e.g., urban sprawl, natural resource and energy consumption, etc.). Natural hazards, land degradation, environmental pollution and climate change are some of the most evident results of the “interactions” between geosphere and anthroposphere. At a finer spatial scale, geo-environmental and geo-engineering issues in urban contexts or in the proximity of infrastructures represent a wide set of challenges that directly impact on the critical zone (e.g., Giardino and Houser 2015). In this context, spatial and spatiotemporal data are crucial for the analysis, modelling and forecasting of the possible interactions between human activities and the geoenvironment. The technological developments achieved in field and laboratory instruments, including geophysical, proximal and remote-sensing devices, increase exponentially the amount and heterogeneity of geoenvironmental data that can be collected (e.g., Pereira et al. 2018). The ever-growing quantity of geoenvironmental data is distinguished by an extreme variability of information characteristics including its spatial sampling network geometry, its spatial support, its uncertainty, and its typology (e.g., hard/soft). The cited aspects have a strong influence on the spatial analysis methodologies that can be adopted (e.g., Kanevski and Maignan 2004; Daya et al. 2018). Moreover, the choice of a specific spatial data analysis methodology is also dependent on the objectives of the study and on users’ specific knowledge. And, of course, there is no single approach that will always perform better than all the others. This means that finding satisfying solutions in specific applications requires a good understanding of the strengths and weaknesses of existing approaches. To that end, their behaviors need to be investigated in a wide variety of situations, which may ultimately lead to the creation of a sort of collection of “spatial data analysis recipes”, capable to highlight their common “ingredients” and specific “taste”. These considerations prompted us to organize during the last three European Geosciences Union (EGU) General Assemblies (2016, 2017 and 2018) a conference session titled “Learning from spatial data: unveiling the geo-environment through quantitative approaches” (conveners: S. Trevisani, I. Bogunović, M. Cavalli, S. Crema, J. Golay, P. Pereira, A. Piedade, G. Teza). This initiative has been promoted in the last few years also in the context of the annual meetings of the “Geosciences and Information Technologies” group (GIT, a section of the Italian Geological Society, http://www.gitonline.eu), with a scientific session specifically dedicated to spatial data analysis. The session has been envisioned for exploring how the modern earth scientists use advanced geospatial analysis methodologies in their research. 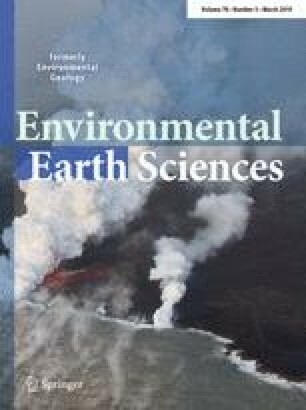 The present topical session in the Journal of Environmental Earth Sciences has been promoted during the EGU-2017 meeting; the choice of the Journal has been specifically performed given the focus of the session on geoenvironmental challenges. In particular, the interest of the session and, ultimately, of the present topical collection, is on studies presenting intuitive and applied mathematical/numerical approaches, capable of highlighting their key potentialities and limitations for the interpretation, characterization and modelling of environmental processes. Given the complexity and multidisciplinarity of the topic, the wide set of research issues addressed and the different theoretical approaches applied by the contributions of the special issue are not surprising. It is worth noting that even the more mathematically complex papers (e.g., Grillenzoni 2018; Gozzi et al. 2018; Fouedjio and Klump 2019) have a strong applicative counterpart. For example, Grillenzoni (2018) presents an open-source software implementing a very promising algorithm with interesting potential in the context of seismology. The compositional data analysis approach proposed by Gozzi et al. (2018) is extremely powerful in the context of geochemical analysis. Three other papers are related to the evaluation of soil resources, also with a focus on remote sensing technologies (Bogunovic et al. 2018; Polinova et al. 2018; Šestak et al. 2018). Related to remote sensing is also the work by Ahlmer et al. (2018), focused on natural hazards (floods). Another set of papers include works mainly related to geomorphometry, partly overlapping with remote sensing, covering various issues such as human impact on landscape (Xiang et al. 2018) and structure from motion photogrammetry applied in the context of debris-flow monitoring (Cucchiaro et al. 2018). Then, a paper covers the important topic of ground water quality and it is focused on background levels determination (Dalla Libera et al. 2018). Finally, the work of Trevisani and Boaga (2018) presents a data fusion approach applied to soft data for mapping the seismic impedance contrast in the historical city of Venice.